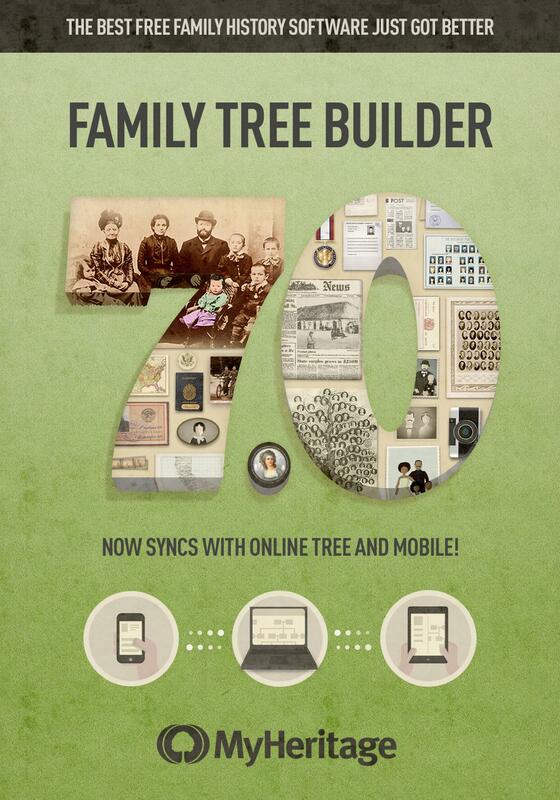 We’re pleased to announce the release of MyHeritage Family Tree Builder 7.0 – the latest version of the world’s most popular free genealogy software – which combines innovative technologies with easy-to-use features. Used by millions of people worldwide, Family Tree Builder lets you build your family tree and enhance it with photos, historical records and more. The latest version, 7.0, is packed with exciting new features and improvements. We’ve been working hard for more than a year to enhance Family Tree Builder to make documenting and sharing your family history even easier. We’re taken the time to ensure this release is as robust as possible and have just completed a successful two-month beta program with some of our power users. Enthusiastic feedback from the first users to use version 7.0 indicates that this is the best version we’ve ever released. 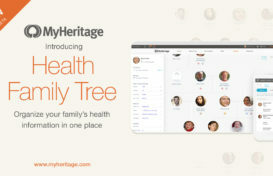 The new version now syncs your entire family history in both directions between your computer and your family site on MyHeritage, as well as smart phones and tablets, and opens new channels for discovering relatives and billions of historical records with our advanced matching technologies. This means you can now access your family tree securely not just from your computer but also from your online family site, smart phone or tablet device, and even grow the tree and add more information and photos to it, any time and anywhere. All additions and changes will sync back to your Family Tree Builder software on your computer. With a new graphical facelift for better looks and an updated user interface, Family Tree Builder 7.0 supports 40 languages, including Chinese, Japanese and Korean, now available for the first time. Already using an earlier version of Family Tree Builder? Upgrading to the newest version is easy and free. Your existing data will be backed up automatically and will not be affected. Perform a single sync, and you can start editing your family tree online, too, and begin using our free mobile app to edit the tree using iPhone, iPad or Android. If you’re a new user, download Family Tree Builder 7.0 for free and start a new tree, or import your GEDCOM to get started. 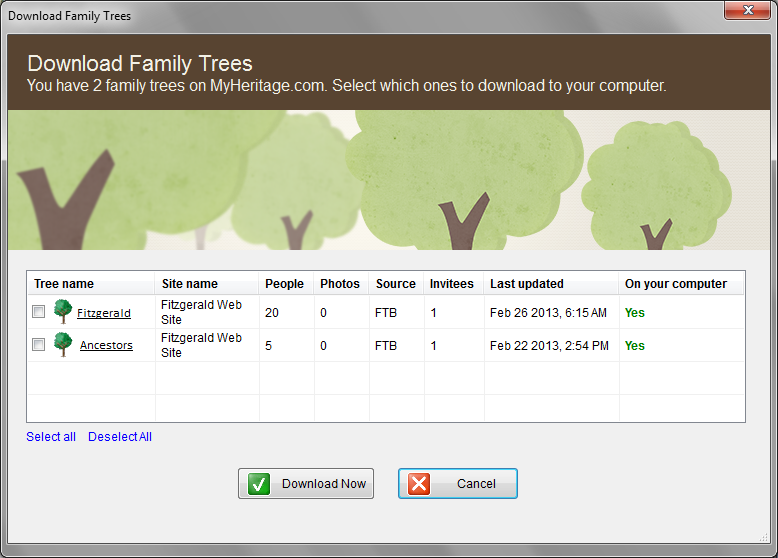 Already have an online family tree on MyHeritage.com but not using the Family Tree Builder software yet? 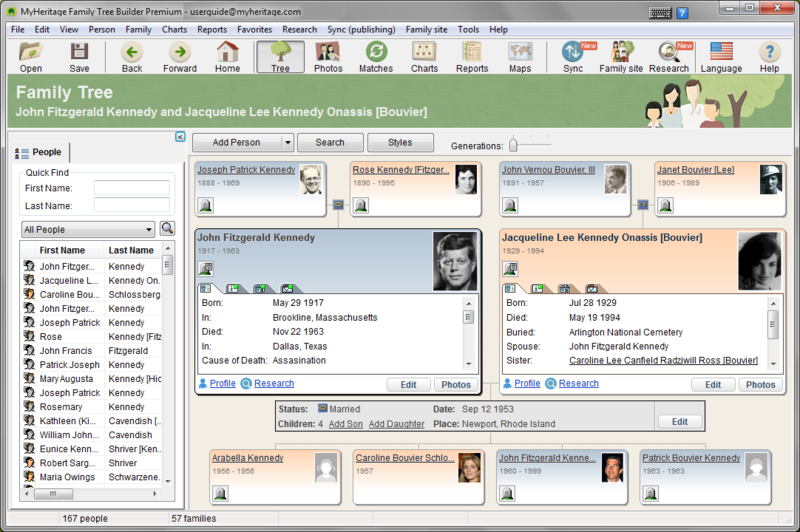 You can now download Family Tree Builder 7.0 for free. It will automatically prompt you to restore your tree from MyHeritage.com to your computer. After doing that your tree will be in sync, and you will gain a local copy of your family tree data, which is always a good idea for extra backup. Currently, editing a synchronized family tree online or via mobile is restricted only to the family tree’s creator. As the site creator, you’ll be able to share your family site with others, but only you can make changes. We’ll soon be adding a permission system that will allow you to grant other family members the ability to edit the synced tree too, if you like collaborating with other relatives on enhancing the tree. 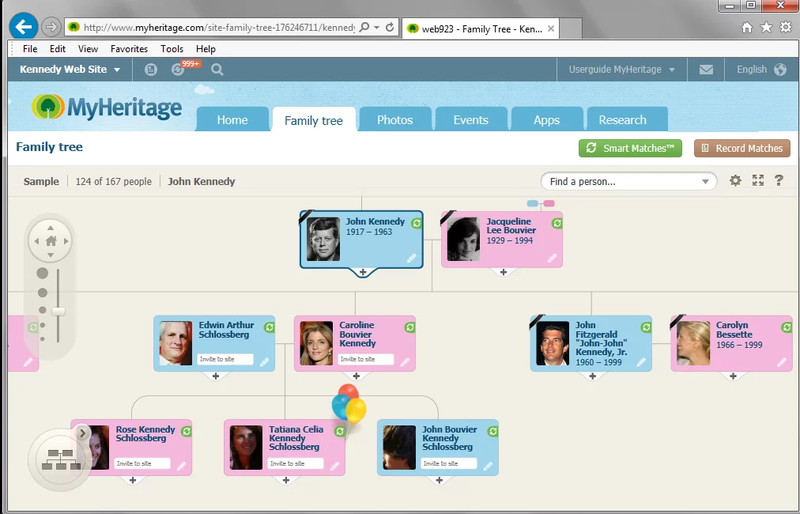 One of Family Tree Builder’s main features has always been publishing, which allowed users to post their family tree directly from their computer to their online family site at MyHeritage, in one click. 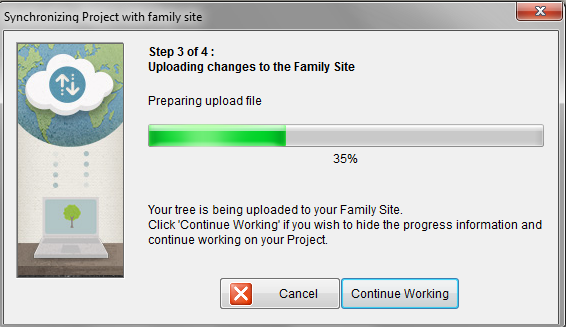 It has been available since version 2.0 of Family Tree Builder in 2008. Publishing has allowed millions of users to gain a backup of their data and enjoy the many benefits of the online family site, but it worked only in one direction, so the online tree was read-only. As of version 7.0, publishing has been improved to become two-way publishing, i.e. full sync, which is an abbreviation of the term synchronization. 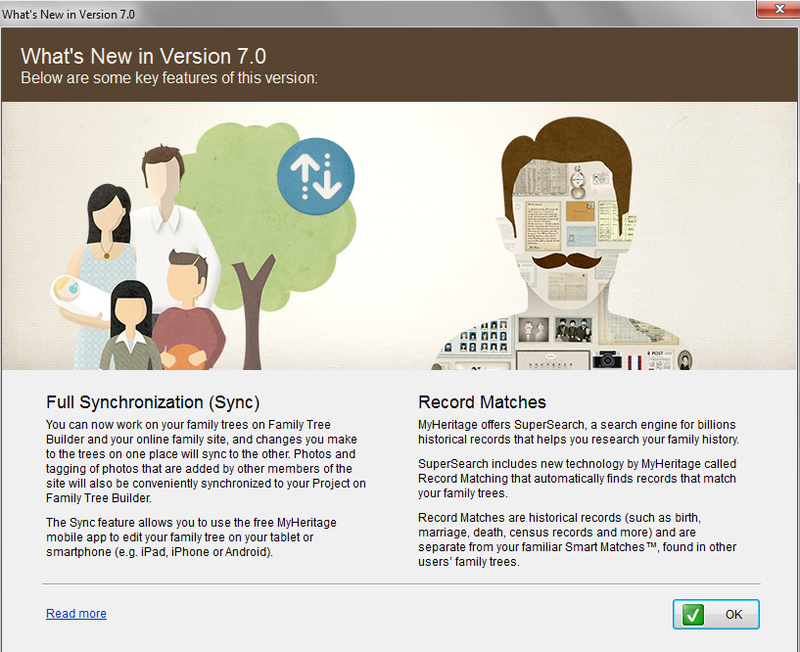 This means that with Family Tree Builder 7.0, you can now edit your synced family tree online on MyHeritage.com or using our free mobile app, and changes made online (such as additions, edits and deletions) will be applied in Family Tree Builder on your computer in the next sync. Goodbye, read-only. All family tree information is synchronized – including photos, videos, audio files, notes, sources, citations and anything that is added to the tree. You can sync manually whenever you want, or schedule automatic sync to avoid ever having to worry about it. Simply put, sync completes the MyHeritage architecture and implements “genealogy in the cloud.” Users can have one tree and, at any moment, use a computer, browser or mobile device to grow their tree and add more data, or simply access the tree and show it to relatives and friends. The benefits of online publishing are numerous. It provides an extra backup online to protect you against data loss in any incident involving your computer. Your valuable family history data will be immune to disk crashes, viruses or computer theft. 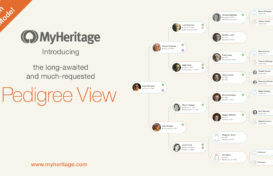 It allows sharing your family tree with relatives and editing “on the go” with our free MyHeritage mobile app. Smart Matches and Record Matches will compare your synced tree to billions of family tree profiles and historical records to make discoveries for you. Have you already downloaded the MyHeritage mobile app yet? It allows you to access and edit your family tree wherever you are, now with support for trees synced with Family Tree Builder too. On the main button bar, click the blue Sync button to synchronize the tree with your family site. The Sync menu gives you access to sync settings and the list of family sites in your control. The sync may be brief or long depending on how many updates have been made and how many new photos have been added. During the sync, you can click the “Continue Working” button and work on the tree while the sync takes place in the background. This is a useful new feature because you no longer have to wait while the process is taking place. If any conflicts are encountered during sync, you will be notified. Once the sync is complete, your family tree will be on your family site ready for you to view or edit it there. Your privacy is important to us. Private data entered into Family Builder – such as DNA marker information, SSN fields and all fields marked as “private” by the tree creator – will not be synced with the online family tree. As of version 7.0, Record Matching technology comes to Family Tree Builder, augmenting our existing Smart Matching™ technology to match billions of historical records on MyHeritage to your family tree. With a growing collection of records, advanced algorithms and a lot of server power, Record Matching finds matches that many users would not be able to make on their own, in high accuracy and effortlessly. If records are found for any person in your tree, a brown icon (usually on top of a large green button) will appear in the profile card in tree view. Click it to view the matches. You may confirm or reject any Record Match. We’re adding very soon a set of screens to extract information from Record Matches into your tree, and automatically create sources and citations for you. For now, review the matches, and edit your tree to add any useful information they bring. Record Matching is the first and only technology in the world to automatically find relevant matches for family trees in newspaper articles, books and other free text content. This is even better news for you because MyHeritage currently holds the world’s largest historical newspaper collection, dating back to the 18th-century, and uses it with this technology. That’s in addition to finding matches in structured records such as birth, marriage, death and census records. 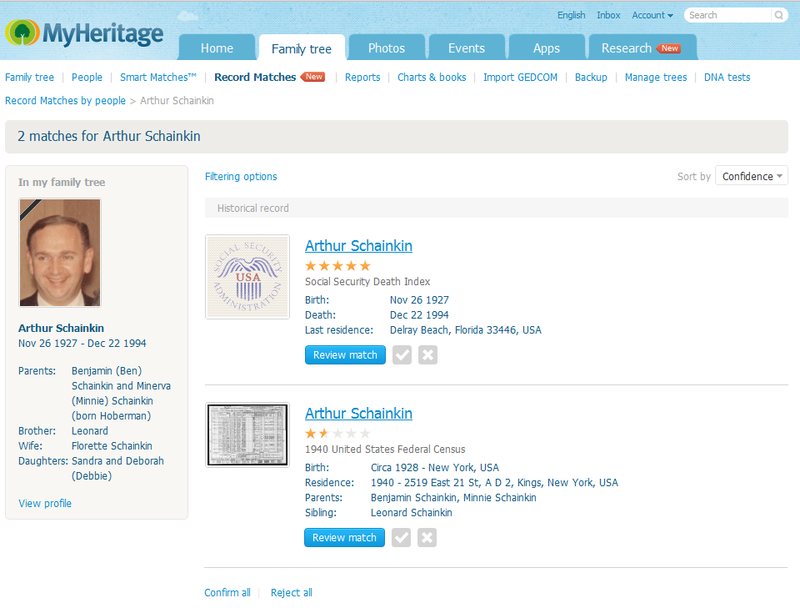 In short, Record Matching helps you discover substantive information on the lives, personalities and achievements of your ancestors. A Record Match can often lead to an exciting discovery and open the door for more research. You never know what you’re going to get. Our collections include newspapers, census records, birth marriage and death records, headstones, military records, yearbooks and even wanted posters and mugshots! Record Matching can reveal juicy information. Is there a black sheep in your family? 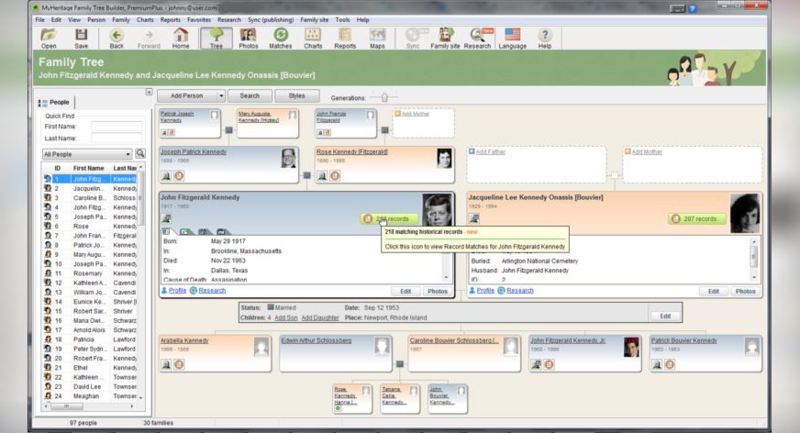 Record Matching on Family Tree Builder 7.0 replaces the obsolete Smart Research feature and the World Vital Records integration, that existed in former versions. Some Record Matches can be viewed for free, while others require a separate data subscription on MyHeritage, not related to the Premium or PremiumPlus subscription of the family site. Record Matching is a ground-breaking technology that will help you improve your family tree with evidence derived from historical records. It was recently praised by well-known genealogy bloggers and opinion leaders James Tanner and Randy Seaver as “magic“. We hope it will work like magic for you, too. MyHeritage is a worldwide family network. To facilitate the best support for different languages, the new version 7.0 of Family Tree Builder has been rewritten to support Unicode. All data can now be entered in any language and is saved accurately as entered. Previously, text and data could be stored in a single language, but users could not mix and match different languages. The new Unicode support allows Family Tree Builder to record data entered by the users in any combination of languages and symbols. Family Tree Builder 7.0 has been expanded from 36 to 40 languages, by adding support for the first time for Chinese (Simplified and Traditional), Japanese, Farsi and Korean. Former versions of Family Tree Builder stored family tree projects in .ZED files (ZED stands for Zipped GEDCOM). As of version 7.0, Projects are stored in .UZED files (UZED stands for Unicode ZED). Family Tree Builder includes a very wide set of features, and is ideal for beginners as well as professionals. Its features include photo albums, automatic face detection technology for photo tagging, beautiful family tree charts, poster printing, reports and statistics, interactive maps, support for DNA results, automatic consistency checker and much more. We’ve updated the look of Family Tree Builder 7.0 with new icons, category graphics, wizard images, and more. We also implemented feature requests and suggestions from our users, to make the new version a joy for family history lovers. Whether you are upgrading or installing for the first time, Family Tree Builder 7.0, like all earlier versions, is free. Even though you can add an unlimited number of people in the software, you’ll need a Premium or PremiumPlus family site to publish (sync) a tree with over 250 individuals into your family site. However, with a one-time purchase of a Premium or PremiumPlus subscription, Family Tree Builder becomes premium for life, requiring no further payments, with permanent free upgrades, unlike other products. A data subscription or pay-as-you-go credits is required to access historical records (users with a World Vital Records subscription get a complimentary MyHeritage data subscription). An affordable bundle is available to combine a Premium or PremiumPlus family site with a data subscription to give you the best of everything. With such a bundle you would still be paying less than half (in fact, close to a third) of the price of our main competitor, Ance$try. Merging of Smart Matches – Smart Matches is a unique technology that intelligently matches your family tree to hundreds of millions of profiles in other family trees, to discover people you may not have known. Merging allows you to extract information from Smart Matches into your own tree. All-in-one charts – all your relatives plotted in a single chart. Interactive maps to visualize your ancestors’ journey through life. Packed with great features you will not find anywhere else, Family Tree Builder is a great tool for beginners or professionals interested in family history. Enhanced in version 7.0 with an advanced sync system, Record Matching technology, better looks and new language support, our technologically advanced, easy-to-use software will help you to build your family’s digital legacy and preserve it for future generations. Family Tree Builder is currently available for Windows. We’ve started working on adding support for Mac OS X too. Mac users, please lend us your patience, we’re working to bring Family Tree Builder to you too. We invite you to register for our free Family Tree Builder 7.0 webinar to learn more about the product. In the webinar, MyHeritage’s chief genealogist, Daniel Horowitz, will demonstrate the product, describe the new features and be happy to respond to any questions. Download Family Tree Builder 7.0 today. We sincerely hope you’ll enjoy the new version. Sounds great! Hope to download today! Family Tree Builder is the most fantastic tool in the service of family history. synchronization in both directions and editing in apps!!!!! Downloaded Family Tree Builder 7.0 a week or so ago. I am enjoying working with this version. Much easier to work with and being able to make changes before confirming matches. GREAT WENT DOWN MEMORY LANE. A great site I like the way I can see all family events. This is the most simple and easiest program that I have used so far ,as i have used quite a few. Just loving it. Like the upgrade very well. Now my main historical software package. Wonderful, I plan to download very soon. I will appreciate the updated version. Looking forward to see how it turns out! It is wondefull Projesct. Thank You very much! It looks AMAZING!! I shall have to try it our! these are some of the biggest and most exciting changes I’ve been waiting for… i can’t wait to try out the new, fully synched clients on all of my client systems…. And, I’m eagerly awaiting the ability to give permission to others to help edit! Looks to be quite a update to earlier years to get information into the tree and more pictures. Just downloded this version and looking forward to getting into it. Just love the Family Tree. looking forward to this version. Thanks for the new version. I am looking forward to using that. Can I do the editing to change a name? I will have great time working on this great program. I have waited for 4 years – I am excited…looks great. This version looks very alluring. Love your article! Future Genealogy hopes to leverage cutting edge technology methods as they are discovered. Everyday a genealogist researching family history story makes the news. The demand for information and services specifically referencing technology and methods continues to increase. The good news for family historians of all interest levels is that new sources and research opportunities are becoming available every day. Love the fact that many can contribute, and we have been looking for exactly that.